This week I’m at Paug’s Access conference in gorgeous Silverfalls, Oregon. I’ll be live blogging here so come back here often for frequent updates over the weekend. Yet again this year’s conference was sold out, not because there’s a ton of people here but there is a low threshold of attendees due to the facilities. It lends itself to a small gathering of less than 100 people and a great atmosphere of sharing. Each year I book earlier so I don’t miss out. In addition, we had people from Brussels Belgian and Australia this year, which I think is a testament to the value of the conference. I don’t have exact numbers but it seams that this year we have more independent consultants, but we still have a good mix of programmers, non-programmers, government and private enterprise people. I enjoy coming in early and taking the walk around the Southern falls and being one with nature for a few hours. This year I arrived 30 mins late and had to do it alone, but I enjoy coming here and seeing and hearing the roar of the water as the mountain caps melt. I will post photos and videos when I get back home, simply stunning. Word to the wise: Bring hiking shoes and be prepared to hike a couple of miles going downhill and uphill. My sedentary programming job doesn’t prepare me for these hikes, but I love doing it. F. Scott Barker – Automating Applications from Access. Scott’s a great presenter, he kept us roaring with laughter, which is a great sign of a wonderful presenter, and had something for both the beginners and pros in the room. Scott established what would be the norm throughout the conference – speak up and let’s make this interactive. We took it to heart and peppered him with questions and observations. Break – veggies! Thanks John! Luke blew it out of the water with the most comprehensive discussion on this topic I’v ever seen. He had 1.5 hours and did not stop for a breather, going through 50 slides of great info complemented with tips and personal experience. Armen did a great job hosting a wonderful session where we discussed many aspects of having a practice. We discussed a wide range of topics: quotes, estimating, handling clients, you name it. Worth the price of coming out here just for this. We all ended up at one of the buildings here and talked late into the night at the social, catching up with old friends and talking IT, sports, etc. plus smoking my stogie and drinking my fav beer. Nothing new for me here, saw the same things I saw at MVP conference and still can’t talk about it till the pre-release is out. Lots if interest and questions from the audience on this topic. I’m not a fanboy of Microsoft’s cloud resources but Armen made a great case for the move. He mentioned how using Lync he can be on a conference call and have it switch to the phone and not miss a beat. The economics are so cheap that if you’re not using Exchange with Outlook you really don’t have an excuse to make the switch. Learned something new today: you can use API calls to create network drives, both interactively or behind the scenes. Also, always use the API vs File Dialog ActiveX object since the API version works every time. Note to self: Don’t change working demo code to try out suggestions from audience members, never leads to a good result. Scott touches most of the usual APIs we commonly use: Zip and Unzipping, user names, file dialogs, etc. This topic is near and dear to my heart, so I was looking forward to Alison’s presentation. She did a thorough review of upsizing Access. Everyone peppered Ryan with questions on the future of Access: No VBA is NOT going away. Don’t know when Office 15 is coming out. 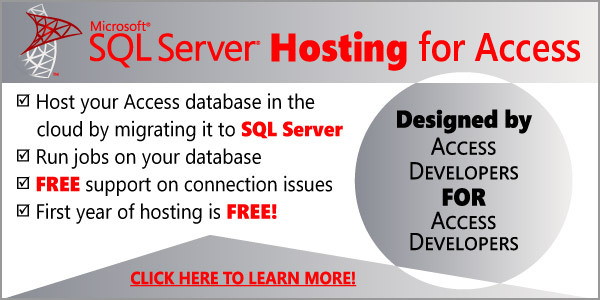 There is no Developer certifications for Microsoft Access. Please share the information or links on using API libraries in Access.